There’s no question that the holidays offer a greater opportunity to eat your weight in sugar than any other time of the year. If you are pregnant during this holiday season, you might be looking for a more healthy option that satiates those sweet cravings without spiking your blood sugar to scary levels! Mixing protein sources with sugar can help limit such severe sugar spikes and keep you feeling fuller, for longer. 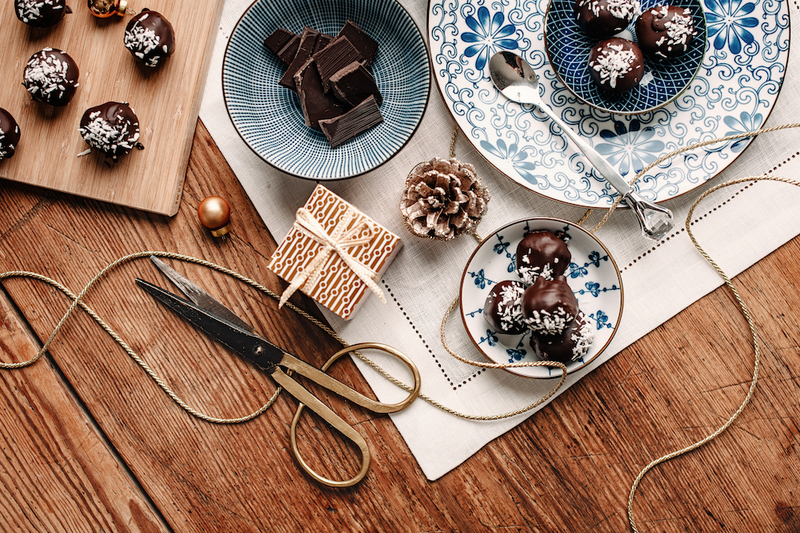 Dark chocolate peanut butter truffles, from EatingWell® Magazine, are the perfect holiday treat to get you through those holiday parties and all of that exhausting shopping! You can even add chopped peanuts, coconut shreds, or dried fruit on top of the truffles for some extra color and nutritional value. These truffles use very few simple ingredients and are dairy-free, egg-free, soy-free, gluten-free, high fiber, low sodium, and vegetarian. Dark chocolate also contains potassium, phosphorus, zinc and selenium; along with antioxidants such as polyphenols, flavanols, and catechins. The bioactive compounds in cocoa can also improve blood flow in the arteries and cause a small, but statistically significant, decrease in blood pressure.2 You should be careful not to eat too much dark chocolate though, as it contains caffeine! The minerals supplied from these truffles are ideal from a dessert. Importantly, these truffles also mix two good iron sources, which is important for pregnant women because the demand for iron increases steadily throughout pregnancy, especially in the second and third trimesters.3 Therefore, it is important that pregnant women are getting enough iron through their diet and prenatal vitamins. PrimaCare<sup™, a once-daily prenatal vitamin, delivers 30 mg of iron along with other key nutrients so supplement a healthy pregnancy! REFERENCES: 1. Howard, Joy. Dark Chocolate Peanut Butter Truffles. EatingWell Magazine. Website. Published January/February 2018 Issue. Reviewed December 13, 2017. http://www.eatingwell.com/recipe/261811/dark-chocolate-peanut-butter-truffles/. 2. Gunnars, Kris. 7 Proven Health Benefits of Dark Chocolate. Healthline. Website. Published May 30, 2017. Reviewed December 13, 2017. https://www.healthline.com/nutrition/7-health- benefits-dark-chocolate#section8. 3. Millman, N. Review Article: Oral Iron Prophylaxis in Pregnancy: Not Too Little and Not Too Much! Journal of Pregnancy. Volume 2012. Article ID 514345 doi:10.1155/2012/514345. 4. Peanut butter Protein Content. Website. Accessed December 13, 2017. http://www.dietandfitnesstoday.com/protein-in-peanut-butter.php. 5. Peanut butter Iron Content. Website. Accessed December 13, 2017. http://www.dietandfitnesstoday.com/iron-in-peanut-butter.php.